Back at home, I tasted the cane juice and it was good, but I realized it suffered a tad from the bout of freezing if only for a day or two… it was murkier than the freshly squeezed product, but the taste was still very good and quite refreshing. I decided to serve it in a pitcher filled with ice and with five pieces of kalamansi squeezed into the pitcher to brighten the taste of the cane juice. Everyone thought it was a nice way to enjoy the cane juice. I also tried it mixed with some Perrier or carbonated spring water, but it didn’t taste too good that way. I suspect this would also make a nice cane and kalamansi sorbet or frozen dessert. 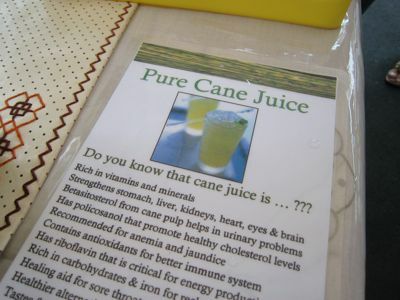 The Pure Cane Juice stall at Legazpi had a list of benefits from drinking the juice, but I just like the taste of it. At PHP120 for the largest bottle, it easily made 6-7 glasses of drinks at the brunch. And it was a whole lot easier than buying the fresh sugar cane and trying to extract the juice yourself! durimg my dad’s last days sugarcane juice is one of the things he ask for. i used to buy it in shoppesville in greenhills near the post office or if my brother is in manila in chinatown and brought home to the province in a cooler. I really do love this blog! Such interesting and creative ideas..and the twists you come up with, with the otherwise mundane! I appreciate so many more things nowadays after reading this your posts. This juice concoctions sounds so refreshing, it makes me want to try it out immediately! 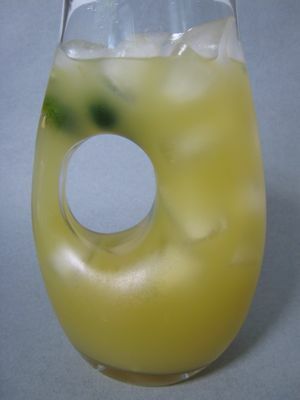 Hmmmm…It’s too bad Chinatown is 30 minutes away for me to purchase “tubo” …Looking at that pitcher, MM , I am thinking smushed up mint or maybe smushed lemongrass with ginger juice (for kick)…then strained and served in a martini glass…Hay, it sure is nakakauhaw!!! betty q., between yours and MM’s ideas, “solb na solb” na talaga ‘ko! thank you!!!!! love the juice, but i love pitcher even more! I love your pitcher. Where did you get it? I’ve been trying to find one like it. A restaurant I frequent in Finland has them. They told me they ordered them from an Italian company that does restaurant supplies. Then I spotted one at a wine shop in Singapore. I thought it was too expensive. Michelle: MM’s pitcher is an Ona…their signature thing is the off center handle…If you are in the US it is readily available at Crate and Barrel…price range about $16…I hope that helps you. 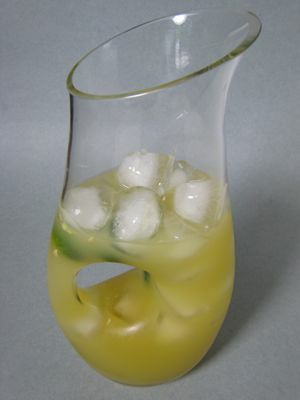 You can order it on line as well and I think they will ship it to you…..That pitcher is a conversation piece as well…. I would give anything to be invited even to a snack at MM’s house to see his awesome collection such as this !!! I like your pitcher, Where did you buy it? Where I am, for calamansi juice, instead of sugar, people put samboy [red champoy]. Weird taste at the start but one gets used to it and starts craving especially on hot humid days! Thank you Betty Q for the information! That’s a combination I wouldn’t thought of in a million years. Where I am, that’s one of the things I look forward to when going to the Asian Market, freshly squeezed sugarcane juice, that and a Vietnamese Banh Mi. my mother dear used to plant the white one. but some say that the red one is better. Michelle: Once in a while…check out e-bay…like today, there is an Ona pitcher BRAND NEW as well up for bidding and reasonably priced too…seller will only ship in the US though…if you see this comment today, e-bay is worth checking out!!! betty q. I actually checked it out! With lots of sugarcane around here, will prepare this soon, although the problem would be how to extract the juice? Hey Homebuddy: Easiest way is to pass it thru a juicer…Another option:maybe cut them into small chunks, put them in a bowl and press with a heavy object. Wrap them in clean cacha and wring the cacha to extract the juice….might take you forever though to make ! pitchel….OR put the chunks in a blender or food processor and line a mesh strainer with cacha and put the sugar cane puree…might take you whole day to get the juice though!!! yung sugarcane sa salcedo binebenta pati ang tubo kung gusto mo nguya-nguyain. tapos idura mo nalang sa market para hulihin ka ng tanod…..(joke). lily idontknowherfamilyname will squeeze as you order. o kaya bottled pwede din. she has a battery powered machine. pero itong version with calamansi mukhang masarap. Oh i love “tubo” back in the days, i love it cold, it’s so resfreshing during hot summer days! I didn’t know that you can make a fresh juice out of them, interesting! Thanks for the post! Hi! Could you send me info on how I can get some of that bottled sugarcane juice? I’ve never tried it! Looking forward to drinking one with and without calamansi! it gives me an idea what to bring back to milan after my vacation. my friends would appreciate this, im sure. their bilins include mango and other fruits from the philippines. does anyone know plane regulations on durian? this is interesting. i want to squeeze the juice myself. where can we buy the squeezer? 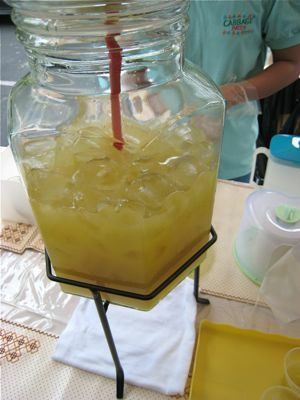 Sugarcane juice really tastes good especially if it is freshly squeezed with calamansi…. (i mean drinking it right after it is squeezed, add cube ice – not the bottled one). it is actually very popular in singapore, india and australia. You can actually have it as an alternative drink during your special events – just for a change, and i’m sure your guests will love it. Not to mention the wonders it will do to your body. You can email me at ralcanejuice@yahoo.com if you are interested in trying it. Hi, I learned that taking fresh sugar cane juice gives us a lot of health benefits. I would like to know how to extract fresh sugar cane juice. Is there an equipment needed to use to extract it? Lot, you need a “press” made out of iron to squeeze the juice out of fresh cane. 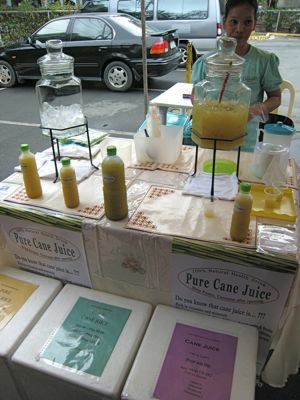 I would like to know if there is a supplier of pure cane juice as i am planning to sell it this summer in my place in Bagong Pag-Asa, Quezon City. I am startin to get so interested with sugarcane juice. A few minutes ago I was surfing d net tryn to do some research. Sad to say that contamination during the preparation is very much possible.Salmonella, E.Coli and Lactobacillus species were isolated from the juice. I am now startin to wonder if pasteurization or sterilization can damage the natural property. Do you have any idea about this? I would really love to hear them. Thanks. In Guyana cane juice is easily found with street vendors.They use a manual metal press.My father used a wooden press in the earlier days.This was common with the many indigenous tribes of Indians in Guyana.We knew nothing about “kalamansi” juice,but a little bit of lime juice adds flavor,and “settles” the minute solid particles which pass through the straining process.When “home made” it is delicious on a hot day.Sad to say,the street vendors “water it down” with too much ice.Great memories of Guyana. wat is the recipe of the sugarcane juice drinks? i just want to know. coz the topic in my feasibilty tacles about it. To Pogi, I’m very much interested, as I am looking for a supplier for sugarcane. And to any other sugarcane suppliers out there, I am willing to order at least 10 kilos a week. Email me at vietkitchen.info@yahoo.com. Thanks! This post is still getting comments. Not at all Amazing !! As all people from Bombay are familiar with the Road-side sugar-cane juicing machines. We dont add sugar and/or water, just Ginger and Indian Lime which is crushed along with the sugar-cane, whose juice is invariably sweet. The benefits of this juice are refreshing and nutritious as well as a pick-me-up, in the Hot Summers. Wonder why I did not see this in Market Places in Manila or Quezon city. I would surely like to start one Kiosk in the near future. I have even seen Crushers which run on Diesel, here in India. to all sugar cane supplier also.